Unstructured data is a sort of broad term for an even broader subject. It is as difficult to wrap your mind around the term as it is for unstructured data to be contained. So, what exactly does this mean? Let’s delve in. Unstructured data refers to all of the data that is generated that has no real, tangible record. This can include data that comes from the many forms of social media, and even data that is literally stored in the minds of workers. It can be said that about eighty percent of all data is unstructured. The more unstructured and non-traditional a work environment is, the more unstructured data there tends to be. This is increasing in the complex world of business that we now live in. However, now more than ever, we have a need to capture this data efficiently something that is difficult with the lack of tools and skills that are common in this field. Having explained the term “unstructured data” and it’s uses. It will only be wise to outline some ways in which your business can benefit from managing this unstructured data. Social media has severely affected the daily lives of people and the culture of the world as a whole. We are forever changed with the advent and popularization of social media. The fact that everyone that has access to it is involved in social media should provide some insight into its relevance for businesses. So much data is shared and transferred and downloaded through the use of social web services. The amount of people involved means that there are huge audiences receiving and processing this information. Businesses should and most likely do roll with this. The synergy of social media and more traditional business practices most likely create a bigger picture for businesses and their goals. Any good business should put the customer before all else. This is one reason why unstructured data has a huge place in the customer feedback part of business. It is necessary for customers to give feedback and for businesses to listen and even respond to this. Most customer feedback is unstructured, whether it be from social media attention, or just good old fashioned in person notes and conversation. This feedback is invaluable for a good business to be relevant in the world of today. It really is the job of businesses to problem solve, especially before the problem even occurs! It is basically a part of the job description. This is where unstructured data comes into play. It is important for businesses to analyze unstructured data in order to predict their customers’ consumer trends. This goes for all businesses or people involved in the well-being of others (like in the health or education fields). Think about it- if you were part of a health care company, you would want to be able to predict the likelihood of certain people developing certain diseases. The analysis of this unstructured data has the capability of getting to the bottom of the mysteries surrounding clients’ behavior. This is necessary for the health of business. So, How Can Your Business Manage Unstructured Data? Now, with some clarity as to why your business is in need of some unstructured data management, you might ask how it is this possible for you to tap into this information source? One way is through text mining. Text mining, or text analytics, is actually quite common, and is something that most people are probably conscious of. It involves analyzing huge amounts of written texts with the goal of generating fresh information. Now, an aspect of text mining is natural language processing, or NLP. 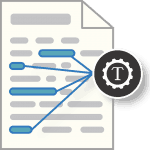 NLP’s goal is to help a machine process and read text. The human language is complex, so this is a pretty great task. It involves disambiguation, natural language understanding, and recognition in order to make use of the original resources. Although differences between text mining and natural language processing exist, they can be extremely powerful when employed together. You might wonder how you can go about designing or buying this technology. NLP requires software that has a very distinct set of skills. This usually involves having a programmed thesaurus, a large vocabulary, and a solid grasp of grammar. This all must be up to date in order to be useful. Some examples of devices that use this technology are smartphone services like the iPhone’s Siri, and translation software that so many people use to get by on. It is now obvious how prevalent unstructured data is, and how important it is for businesses to recognize its use in real world applications. In order for your business to thrive, or even succeed, it should take pains to understand all of the information that is provided to them through the various methods of information sharing and gathering.